NL5 x Haze (1994 Cannabis Cup winner). A superb sativa. A very tall plant with vigorous growth. Fruity sweet & sour smell. This hybrid is the height of achievement in cannabis breeding. An extremely potent plant with an exponential sativa high. 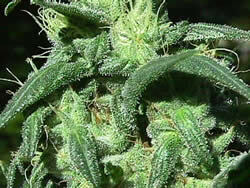 Hybrid vigour produces lush horny growth, heavyweight bud formation & lashings of resin. Test drive 5 x 5 today and feel like you've got a spare wheel. An undulating off-road journey. This product was added to our catalog on Wednesday 23 January, 2008.